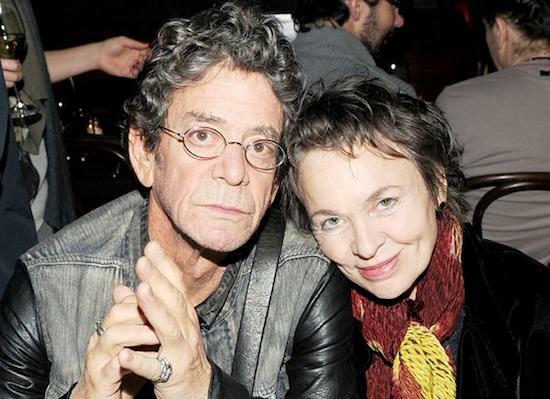 "How strange, exciting and miraculous that we can change each other so much, love each other so much through our words and music and our real lives"
Laurie Anderson has written a moving farewell to her late husband Lou Reed for Rolling Stone magazine for their latest issue, a tribute to the rock star. In the piece, Anderson writes about how they met and first began dating: "As it turned out, Lou and I didn't live far from each other in New York, and after the festival Lou suggested getting together. I think he liked it when I said, 'Yes! Absolutely! I'm on tour, but when I get back – let's see, about four months from now – let's definitely get together.' This went on for a while, and finally he asked if I wanted to go to the Audio Engineering Society Convention. I said I was going anyway and would meet him in Microphones. The AES Convention is the greatest and biggest place to geek out on new equipment, and we spent a happy afternoon looking at amps and cables and shop-talking electronics. I had no idea this was meant to be a date, but when we went for coffee after that, he said, 'Would you like to see a movie?' Sure. 'And then after that, dinner?' OK. 'And then we can take a walk?' 'Um . . .' From then on we were never really apart." She goes on to write about the moment they decided to get married, how they coped with Reed's increasing ill health and being with him as he died, concluding: "At the moment, I have only the greatest happiness and I am so proud of the way he lived and died, of his incredible power and grace. "I'm sure he will come to me in my dreams and will seem to be alive again. And I am suddenly standing here by myself stunned and grateful. How strange, exciting and miraculous that we can change each other so much, love each other so much through our words and music and our real lives." Read the piece in full at Rolling Stone's website.